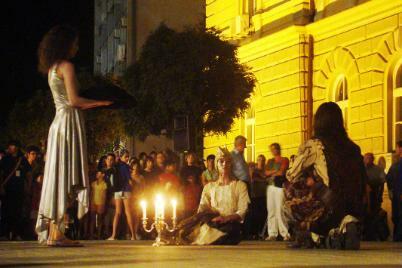 Street performance ``Illuminations`` is an abstract form which lights the torches of history and myths involved in the creation of the city of Smederevo, and takes us to the future, imagination and pleasure. In the main city square artists in costumes from different époques are met with the public resulting in a timeless ritual which offers abstract symbols interpreted in various ways. This enables better communication with the public since they are directly involved in the entire performance. The term Illuminations implies the power of street and square lights during an event, the sudden inspiration and enlightenment, so the primordial light of fire, fireworks and light objects become the mean of communication with the viewers and the citizens. On the other hand, illumination is decorating a first edition of a book with ornaments and miniatures, which we have conducted through the miniatures of workshop material.